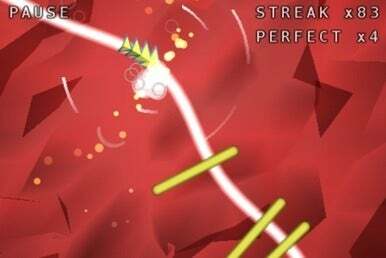 Smule, the developer behind musical iOS apps like Magic Piano and I Am T-Pain, on Wednesday unveiled its latest musically-focused app: Beatstream. It’s a fast-paced casual game where you play along to the music you already keep on your iPhone. To start playing, you select a song from your library, and Beatstream attempts to analyze the tune’s beats and rhythm. Then, a pulsing arrow zips through a track as you listen to your selected song. You tap the iPhone’s screen to toggle the arrow between two different colors, aiming to match the color of the barriers the arrow encounters. Tap too slowly, and you’ll crash; your song momentarily goes staticky. Mess up too many times, and the song goes silent. Beatstream plays a bit like the Tap Tap Revenge series of games, but with a simpler mechanic. You’re tasked with but one job—tap the screen. The game offers three levels of difficulty and two gameplay modes. 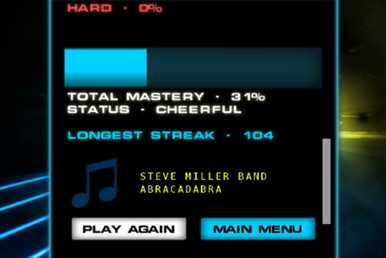 Beyond Regular, there’s Warped, a mode in which continued tapping accuracy actually speeds up the music (and the on-screen arrow); mis-taps result in the song slowing down instead. Between the static and the drastic song slowdowns when you screw up, failure in Beatstream actually sounds pretty funny. Beatstream does seem to get a bit stymied by tracks stored in iCloud via iTunes Match, erroneously reporting that the songs are protected and thus not able to work with the app. You can work around that issue by launching the music app and downloading the songs you’d like to use with Beatstream. The app costs $1 and requires iOS 4.2 or later; it’s optimized for the iPhone and iPod touch. You can see a preview of the gameplay on YouTube.